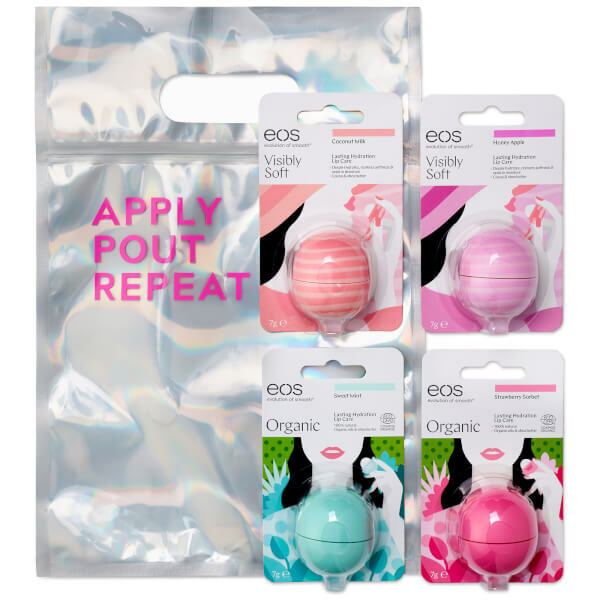 Keep your pout soft and smoochable with the EOS Lip Balm Gift Pouch Exclusive; a limited edition collection of the brand’s iconic domed lip balm spheres in four scrumptious flavours: Strawberry Sorbet, Coconut Milk, Sweet Milk and Honey Apple. 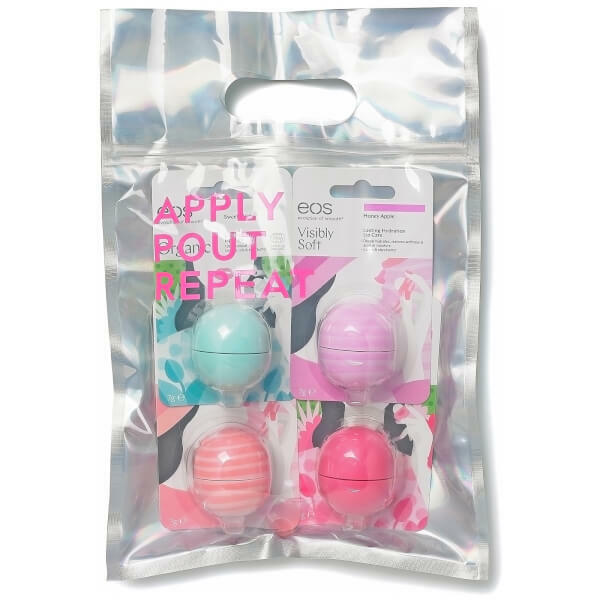 Enriched with a blend of conditioning ingredients including rich Cocoa and Shea Butter, the pout-pampering formula glides over lips evenly saturating them in lasting hydration and nourishment to replenish moisture and restore softness. Each infused with a subtle fragrance, the softening balms leave you with deliciously, kissable lips with a single swipe. Presented in a metallic pouch, the four-piece set offers you a supply of handbag essentials and makes for a perfect present. Free of mineral oils and phthalates. Helianthus Annuus (Sunflower) Seed Oil, Beeswax / Cera Alba (Cire d'abeille), Ricinus Communis (Castor) Seed Oil, Bis-Diglyceryl Polyacyladipate-2, Jojoba Esters, Coconut Nucifera (Coconut) Oil, Oryza Sativa (Rice) Bran Wax, Helianthus Annuus (Sunflower) Seed Wax, Butyrospermum Parkii (Shea) Butter, Theobroma Cacao (Cocoa) Seed Butter, Flavor (Aroma), Acacia Decurrens Flower Wax, Stevia Rebaudiana Leaf / Stem Extract, Tocopherol, Polyglycerol-3, Glycine Soy (Soybean) Oil, Citric Acid.